Free Shipping for Ballet Barre, Wall Mounted Barre with Fixed and Adjustable Brackets for Dance and Barre Method Training. A row of 14 ft. ballet barres made of Poplar wood. Our portable ballet barre and wall mounted ballet barres are Made in the USA! CWF Flooring, Inc. offers four species of wood bars: Poplar, Ash, Red Oak and Maple. All ballet bars are kiln-dried before cutting to insure a precision cut then turned for accurate roundness. Ballet barres are finally machine sanded, wood ends are slightly beveled and lastly spot sanded by hand. We produce high quality wood ballet barres for dance and the bar method training at affordable prices. Due to its superior tensile strength, Ash, Red Oak or Maple wood is recommended for bar method training. The wood bars are not stained or varnished, except for the children's ballet bars which are stained with non-toxic Min Wax™ with color options: Red, Blue, Yellow and Green. The Cartwheel Factory recommends that the buyer does not use varnish to preserve the wood bar. The reason for this is that this may cause the ballet bar to become slippery. Hand sweat needs to be absorbed into the bar to enhance grip security for the ballet dancer or for ballet bar method training exercises. A large stock of wood ballet barres and brackets are ready to ship today. Call our Sales Dept. at: 1-661-273-8700 Text: 1-323-420-6794 for details. We offer FREE shipping for 4, 6 and 8 foot barres. Most bars & brackets ship in approx. 3-7 business days! Length options: 4, 6, 8, 10, 14, and 16ft. Bracket options include wood, fixed chrome, fixed brass, double fixed chrome, double fixed brass (fixed brackets are non-adjustable) double brass and single chrome adjustable and double adjustable chrome ballet bar brackets. Double fixed brackets consist of two fixed brackets on top of each other. Whereas, double adjustable brackets consist of a single channel with two chrome arms. Ballet Barres are a critical part of training and practice of Dance. Consequently, the popularity of Barre based classes are growing and the need for well-manufactured Barres are on the rise. Most bars ship in 2-4 business days! With the growing popularity of at Barre workout regimens bars on more in demand than ever. Gyms with Barre workout regimes are more likely to attract female members. 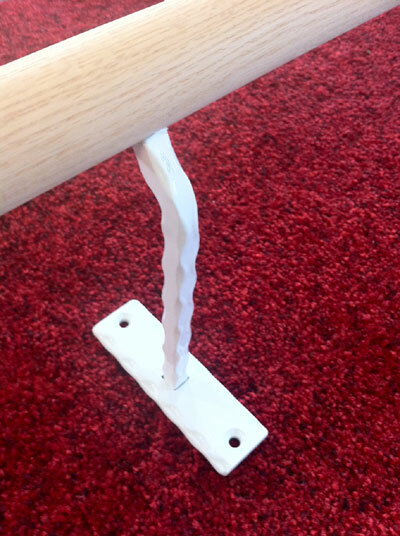 Most ballet bars that are used for bar-system training prefer the fixed ballet bar brackets. White or chrome ballet bar brackets adds tranquility and class to studios with a clean appearance. For dancers who desire to place dance mirrors on the wall between the ballet bar brackets, please consider the bracket spacing between the brackets below. A 48” wide dance mirror can fit in between a 6 foot ballet bar. 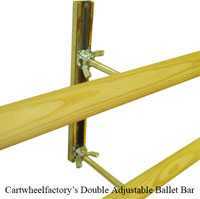 Adjustable ballet bar brackets have the same dance bar spacing. Which Wood Ballet Barre is Best? Before deciding on the type of wood ballerina bar please study the below "Wood Specifications For Ballet Barres." As stated below the maple wood bars are the strongest of all four wood species, as well the most rigid and expensive. For schools where supervision is less than private dance studios we suggest the Ash wood because it is the second strongest of the four woods and can withstand the potential abuse from non-supervised students. Ash, Red Oak or Maple ballet bars are recommended for ballet fitness classes, bar fitness and The Barre Method training. Poplar wood is the most flexible and lightest but has moderate but good strength. Therefore Poplar wood is common for home use and well supervised ballet and dance studios. 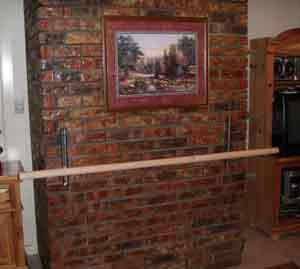 Ballet bars are a piece of furniture-an accent-a center-piece of a dancers room or studio. CWF's ballet bars for dancers or fitness training can meet your design requirements. Let the ballerina choose the wood species: Poplar wood, blond Oak or Maple Barres. Testing ones skill is a substantial part of growing as a dancer and performer. The assurance of stability can be the difference that separates’ your skills from that of your competition. Therefore having a well-constructed, USA made Ballet Barre is invaluable to skill and strength building. 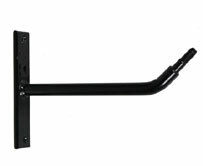 Many are now prepared to have a wall mounted bar installed in their homes. A space friendly option would be a free standing-portable ballet barre that easily disassembles for storage. 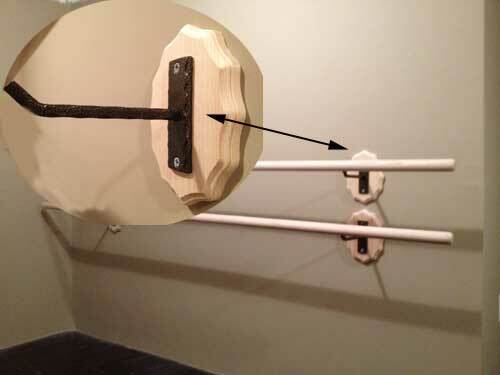 Bring the tools of the studio to the privacy of your home with wall mounted ballet bars. Shipping 10-16 ft. long ballet bars are costly, from $200-$300, because they ship Freight Truck. They're too long to ship UPS-Ground. To save on shipping cost you may consider several 4, 6 and/or 8 ft. ballet bars or combination of. For an estimate on 10ft.-16ft. barres please visit our Custom Barre Estimate Form. Metal brackets for ballet bars can be installed with or without a wood backboards / installed directly onto the woods studs. This photos was supplied by a Allen of Cummings, GA.. Pictured: Antique Double fixed brackets consists of two brackets on top of each other. Customer designed his own wood back-board for the brackets. Options: Chrome, Brass, White, Pink or Black with gold specks. Red Oak, Maple & Poplar wood barre options are available. Dancing, primitive nature relies on stability and balance. When dancing at Barre the stability of the Bar can help or hinder practice. This often decided by construction and wood species. With less expensive -inferior models flooding the market it’s easy to get a less expensive Bar. This is a costly mistake for many Studio owners not only by cost of injury but in multiple purchases of the same Bar. An alternative to this repetition is to buy a made in the USA high quality bar the first time. A quality bar will last, even in the most extreme use, decades not seasons. An investment in the quality keeps dancing safe and profitable. *=Free shipping. 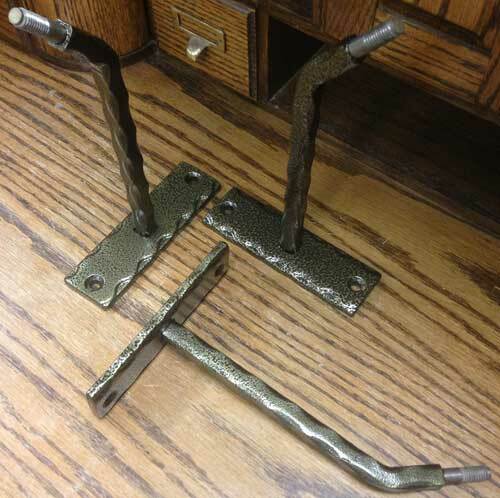 These Adjustable Ballet Bar steel Brackets are very sturdy and weigh 2 1/2 lb. each. (Double adjustable weigh 3 1/2 lb.) They have a bright chrome finish. They come with #12 x 2" flat head screws. Wall channel allows approximately 14" of adjustment. Fixed ballet bar brackets, aka, non-adjustable brackets are made of chrome or brass plated steel. They have a bright chrome finish. These Fixed Height Ballet Barre Brackets are very sturdy and weigh 1 lb. each. They come with #12 x 2" flat head screws. Minimum overhang is 2". Maximum overhang is 20"
All dimensions are approximate and may change without notice. Warp tolerance for wood is 3/16" per 4' section. With a round 9 inch extension arm powder coated silver specks on black. Ballet bar brackets (PDF) have a couple of design options to compliment your ballet dance studio. •Antique Brackets: Color- Black with mild Gold-like Specks or it Gold-like with Black specks? •CWF Flooring, Inc's. Non Adjustable Ballet Bar Brackets are smooth, unfinished and strong. 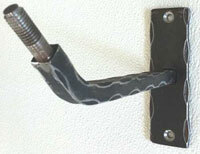 •These traditional brackets can be installed on concrete or dry walls. Chrome Contemporary Fixed Brackets with round arm. Gold Fixed Bracket with square ext. arm. Antique Fixed White with square extension arm. Silver Specks on Black Bracket with round extension arm. All Black Ballet Bar Bracket with Round Extension Arm. Add an antique appearance to your dance studio, school or home dance room with CWF Flooring, Inc's. popular Bolshoi Antique Black Ballet Bar Brackets. Present an atmosphere of dance history & experience to your dance school with the Bolshoi Antique Ballet Non-Adjustable (fixed) Bar Brackets. White, Pink & wood ballet bar brackets. Low Gloss Gold Brackets are powder coated-not painted-for an everlasting shine with a ceramic-like texture. Call 1-661-273-8700 or 1-661-273-8701 for details. Note: For Ballet Bar Method physical fitness training it is recommended that extra brackets be purchased. 1. Which type of wood bar is best? 2. What are the “true” colors of these woods? Poplar wood is the least consistent of our wood varieties. While for the most part it is a light, tan color, there are inconsistencies in the grain which cause parts to be darker, or green in color. Red Oak is, true to its name, a red wood. While its shade is more consistent than the other two types of wood, it is the grainiest of all three as well. Maple ballet bars have a similar light, tan color to poplar, with more consistency in shade, and fewer grains. Ash is a beautiful wood and has wider rustic mild grains. 3. Do I need to hire an installer to put these ballet bars up? You Tube installation instructions for the wall mounted bars and instructions for the portable ballet bars. 4. Can you cut the wood ballet bars to custom lengths? Unfortunately, due to the nature of our stock and manufacturing process, only 4’, 6’, 8’, 10’, 14’, and 16’ bars are available. However, the bars do have a wood over-hang of 8, 12, 16 or 20 inches so, yes, the buyer can cut the bar to one's specifications without hindering the bar brackets. For a four foot long ballet bar you can NOT cut more than 6" off the end of the barre without hindering the metal bracket; six foot/10", 8 foot/ 13". 10 & 14 foot / 18", 16 foot/ 14". 5. The web site is not allowing me to purchase a 10’, 14’, or 16’ ballet bars online. Why is this? Barres larger than 8’ long cannot be shipped by UPS ground, and must be transported by freight truck. To place an order for these bars, you will need to contact us for an estimate at (661) 273-8700. 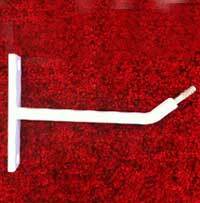 Four foot, 6’ and 8’ wall mounted bars are provided with FREE shipping. These can be purchased online. 6. We are a dance studio/contractor, are you able to provide us with a special price? Unfortunately, we cannot provide a special price for studios or contractors, but we are able to provide larger discounts for larger orders, depending upon your needs. 7. Will the color from the stained poplar ballet bars rub off on bare skin? No, the color used to stain the bars is fully cured and will not rub off on skin or clothes. 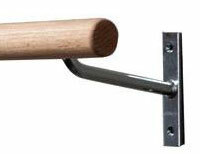 By the way, white fixed metal ballet bar brackets look really great with color wood bars. 8. Where can I fine online ballet classes? 9. Can we use the ballet bars for barre workouts, aka. ballet fitness / Bar Method? Yes, the bars are designed for ballet and bar method training. It is recommended that the end user acquire an extra bracket(s) for added security. 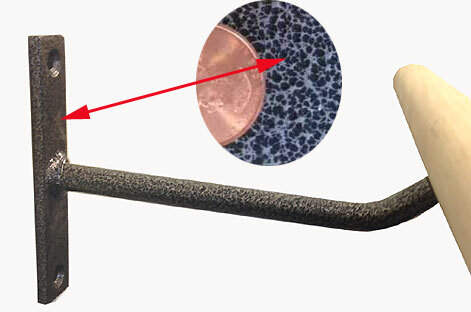 To add extra ballet bar brackets drill an extra holes in the ballet bar to accommodate the extra bracket(s): First drill a hole 7/8" deep with a 3/8" drill bit. Then in the same hole use a 5/16" drill bit and drill 5/8". The hole is now a total of 1-1/2" deep. Further instructions are available at: cartwheelfactory.com/pdf/ballet-bars-instructions.pdf The bar method training system is a great way to stay or get in shape. It's an exercise class disguised as a ballet class. For ballet bar fitness information or Bar Method workout videos please visit Ellie Kemper or visit: Barre Physique of Manhattan Beach , California for barre fitness classes. 10.How do you clean the wood bars? Use a fine steel wool. You may want to use a mask so you don't breath in the wood dust. Use a damp cloth to remove excess wood dust from the bar. Then vacuum the area so dust will not be scattered in your dance room/dance studio. It is recommended that dance students keep their hands clean before dancing or before dance class starts. For health reasons, we recommend that students wash their hands before and after dance class. 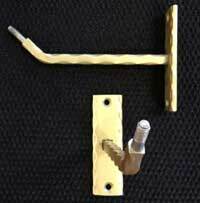 Ballet Bar brackets can be wiped clean with a spray cleaner. 11. I'm undecided to purchase the fixed ballet brackets or adjustable brackets? 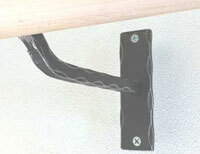 If it's for adults only we recommended the fixed ballet bar brackets. If the program or your dance studio caters to both kids and adults, we recommend the adjustable ballet bar brackets. If your ballet bar brackets are for a ballet studio a combination of adjustable brackets and non-adjustable (fixed) is another option. 12. We have a ballet school in San Francisco, California. In the past we have had metal ballet bars. Hope you can be objective here but, what are the advantages/ disadvantages/ of wood bars -Vs- aluminum bars? Metal ballet barres are cold to touch and are in fact slippery when the hands become sweaty. Wood ballet bars, like a gymnastic bar, will absorb wetness from the palms. If the surface can't absorb sweat then the bar will remain slippery. 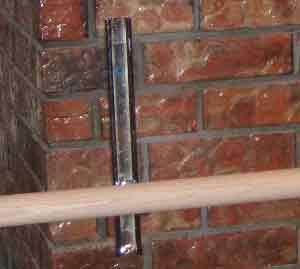 Metal ballet barres are stronger but do not have the flexibility of wood bars. This flexibility provide an anti-stress on joints, especially on the ballet bar method training. 13. Can you splice together two 8 foot bars to make a 16 ft bar. We want to save on shipping costs. Shipping 8ft. bars are free, correct? Yes, 8ft. ballet barres ship for free! Please view Wood Ballet Bar Splice Joint Instructions. 14. Are your ballerina bars oval or round? Our ballerina bars are round and smooth to the touch. 15. We like your wood ballet barres but we don't want to spend the money. Hope you can help me here but can I make a do it yourself (DIY) ballet bar? We don't have information on this type of DYI ballet bars. DIY PVC ballet bars are easy to glue together. However, the plastic ballet bars can be slippery to grasp. We recommend the traditional wood bars for ballet. 16.Can you mail us a free ballet dance poster of the ballet bar positions (Posiciones de ballet)? My daughter is 6 years old and she learns better with pictures than watching the ballet teacher and less my watching me. Sorry we do not have such a product or resource. However, perhaps the Pittsburgh Ballet Resource Guide for Teachers by Lisa Auel will be helpful. 17. We are a barre training studio in Los Angeles. We purchased wall mounted units from CWF in the past. Our program is getting popular and need more bars but don't have the wall space. Do you have floor mounted ballet bars that are permanent / not free standing? 18. We purchased a ballet bar a couple of months ago. We live in Fargo, ND Can you refer us to a ballet studio in Fargo? 19. We live in Knoxville, TN and don't like the gym atmosphere. The ballet barre method training for fitness is a great concept. Can you refer us to a ballet bar method training fitness program in Knoxville? The Pure Barre™ has a ballet barre method studio in Knoxville Stay fit. That's what life is all about. 20. My partner and I are opening up a gym catering to the female species, of which, I am a proud member. We’ll include a ballet barre method exercise class. The question is, what do you recommend for the barre method training, the wall mounted or floor mounts ballet bars? Both of these styles are recommended. If you have the floor space then we recommend the floor mount ballet bars. If you want to maximize your floor space then the wall mounted ballet bars would be a better option. However, if you purchase the floor mounted with a double ballet bar then this must be installed near the middle of the dance room. Whereas, the single floor mount units can be mounted near a wall. 21. My son, yes my son, loves ballet, especially the leaps. I can’t believe how high he leaps. Excuse the boasting. My question is: We want to purchase a tiny ballet bar for his bedroom, about 2 feet long. Can you help us? The smallest ballet barre we produce is 4 feet long. The customer does have the option to cut off 6 inches off each side of the 4 foot ballet bar. If done, this will make the ballet bar 3 feet long. We hope this will meet your needs. 22. In our Los Angeles gym we have barre method training classes. Some gym members complain that the bars are slippery. What should we do? Keep the bars wax-less and oil free. Perhaps a light sanding will remove some of the oils, hand lotions, etc. that have accumulated of the years. Then perhaps on a weekly basis use a fine steel wood to clean the wood bars. 23. I purchased a ballet bar from The Cartwheel Factory a couple of years ago and we use it on a regular basis. We live in Los Angeles, CA and now want to buy new ballet shoes. Can you help us? 2509 S. Robertson Blvd., Los Angeles, CA 90034 can help you. They have a lareg selection of brands and styles of ballet shoes. 24. We saw your 16 foot ballet bars at in Lansing, NY at www.TheNextJennaration.com What's the smallest bar you sell? The four foot ballet is the smallest with fixed brackets or adjustable ballet bar brackets. 25. Our local YMCA ballet classes are expanding. We would like to place a bar on a 12 ft. wall. Should we buy a 10 foot bar or two six foot bars? Without a doubt, (2) 6 foot bars ship for free. Any ballet barre longer than 8 feet must ship via truck freight and will cost more than the bar itself. A 16 feet ballet bar shipping to New York will cost approximately $300 from California. 26. We have a photo shoot and need a ballet bars. We must stain the wood bar for design reason. Which would bar would stain the best? We suggest the poplar wood bar because it’s the whitest. It would color-stain the best. 27. 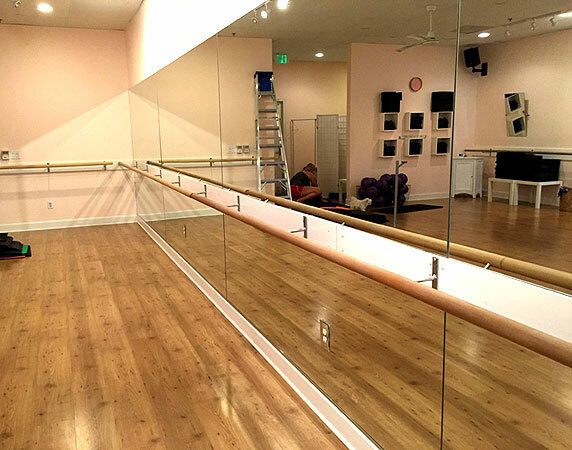 Not sure our ballet studio in Los Angeles, California should purchase the wall mounted or the portable ballet barre. Can you advise me, pls? If you need to share the floor space with another genre of dance or activity then the portable ballet bars are recommended. CWF Flooring, Inc. can produce custom wood barres per your specifications. Kindly fill out the below form and we'll email you an estimate in two hours.